Many benefits come from neutering your male dog early in his life. Undescended testicles occur when the testes fail to pass through the inguinal ring and fall into position in the scrotum. Rather, the undescended testicle remains in the dog’s abdomen or in his groin. Retaining undescended testicles invites serious health problems that are easily prevented by neutering. Both testicles should be palpable -- able to be felt -- in a puppy’s scrotum at some point between the age of 2 months and 6 months. It is not known what causes testicles to fail to descend. However, on some occasions puppies’ testicles for some reason fail to travel from where they develop in the abdomen through the inguinal canal in the groin and into the scrotum. In most cases, there is no pain associated with an undescended testicle. On some occasions, the spermatic cord attached to the testicle becomes twisted, causing the testicle to die due to a lack of blood supply. Although the absence of one or both testicles can be visually apparent, the diagnosis of the condition and the location of the testicle(s) is determined by the use of ultrasound. Very small dogs, especially Yorkshire terriers, toy poodles, and Pomeranians , are at particular risk for retaining testicles. Some particular lines of German shepherd dogs, boxers, and Staffordshire bull terriers are also at risk. Although retained testicles can be hereditary, there is also a possibility that they are caused by environmental factors affecting unborn puppies or genetic flaws that occur in the womb. Some symptoms include the absence of testicles in the scrotum, apparently neutered dogs lifting their legs or showing interest in breeding, abdominal pain and feminization. Undescended testicles may develop interstitial cell tumors or sertoli cell tumors. All testicular tumors may cause torsion. They may also cause the lymphatic vessels responsible for removing lymph (fluid) in the scrotum to become blocked. Such blockage will cause generally painless swelling of the scrotal sack. Sertoli cell tumors will affect the dog’s production of estrogen, potentially causing feminization. Feminization may case milk production, atrophy of the remaining testicle, enlargement of the prostate and even suppressed bone marrow production. This last effect is quite serious as it can lead to infections, decreased production of red blood cells and depressed clotting ability. Torsion is the technical name for the twisting of a body’s organ. 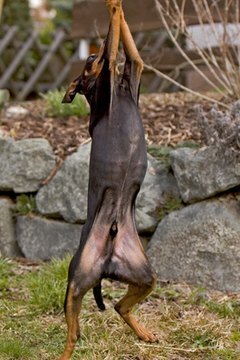 In this case, the dog’s testicle twists on the cord that attaches it to the abdomen. This twisting cuts off the blood supply to the testicle, causing the tissue to die. Some of the symptoms of torsion include severe abdominal or scrotal pain, a lack of desire to stand or to walk, and fever. 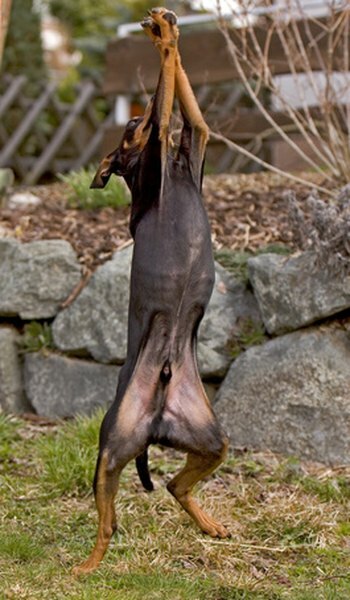 One health risk associated with undescended testicles is their continued or increased appearance in future generations, should cryptorchid dogs be bred. Dogs that have retained both testicles are usually not capable of impregnating a female dog, given that sperm inside a testicle retained within the abdomen is killed by the dog’s body heat. However, some dogs that have retained only one testicle may be able to impregnate a female, potentially passing their condition to their offspring and beyond. Female descendants of cryptorchid dogs may born dead or absorbed by their mothers before birth. In addition, surviving female offspring may experience reproductive issues when bred, potentially affecting the viability of a breed or a line of a breed when cryptorchidism occurs in purebred dogs. How Old Is a Puppy When Their Balls Drop?